Carrick Rangers fans have long been claiming they have the best goalkeeper in the league. 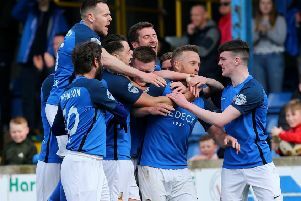 It had proven to be a difficult afternoon at his old stomping ground of Seaview against the reigning champions and current league leaders. “Brian Neeson was outstanding and made five world class saves before they got the first goal,” admitted Callaghan. “But then he is a fantastic goalkeeper who has been great for us all year. “Our problem against the Crues was that while Brian and a couple of others were at their best, you can’t expect to win a game like this with just three of your players performing at their best. “That was the disappointing thing for me as much as I was delighted with Brian Neeson’s performance. “I know he was disappointed with the second goal and felt the ball hadn’t crossed the line from Jordan Owens’ header. “Just before that we had a wee chance when the ball came to Tzee Mustapha but it went over the bar, their second followed soon afterwards and it wasn’t to be for us. “It wasn’t the referee who gave the second goal it was the assistant on the far side and Brian wanted to protest about the decision but the ref stopped him going over to do so and then booked him which was possibly a bit harsh.